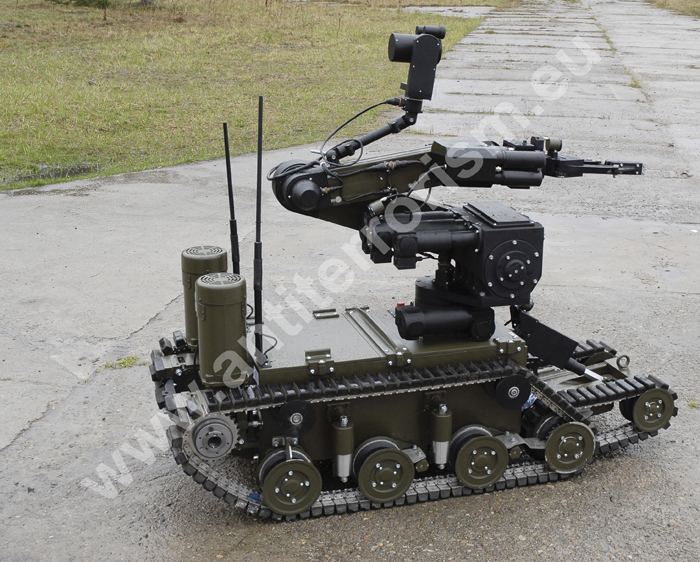 The robot is powered by batteries installed inside the mobile platform or through a cable plugged into the 230V power network. The maximum operation time when powered by batteries is 2 to 8 hours (depending on the operations). During the external power supply (by cable) the batteries are automatically recharged. 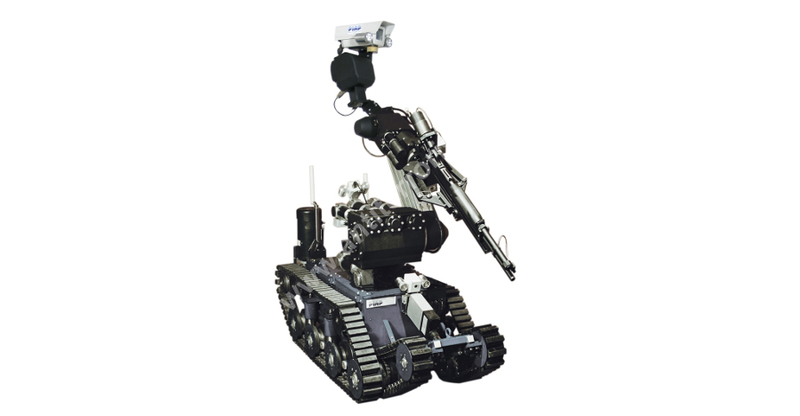 INSPECTOR is equipped with 4 cameras: on the gripper, in back and front of the robot and on the manipulator (the main camera which may be turned completely around by 360° and 90° up and down). 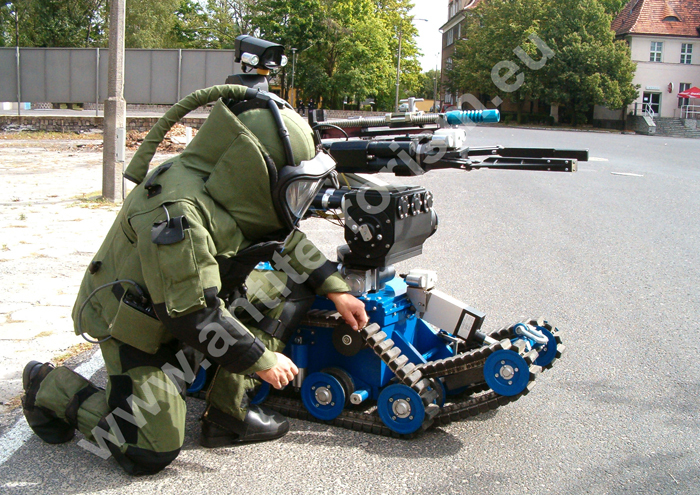 Special driving system reduces recoil effect when firing the pyrotechnical disrupter or in case of explosion of the load placed in the gripping device or its vicinity. The operator’s post is equipped with three LCD monitors, which show, apart from the view from chosen camera, a graphic interpretation of the manipulator arm and front caterpillars configuration. Time of the operation when powered by batteries of the operator’s post together with the console is approximately 4 hours, and the portable console gives 3 hours additionally, what guarantees total 7 hours of the operation. Robot can be controlled by radio or by cable. Control cable is light and mechanically resistant. Fluent velocity control of all the drives from 0 to maximum speed ensures high precision of operation. There is a possibility of the reduction of maximal velocity allowing precision of performed operations (after pushing an appropriate button, the maximum velocity reduces itself to 20%). Audio signal of emergency situations in the control console alerts operator in case of irregularity in robot’s function. Illuminated keyboard of the control console enable to control in the dark. The INSPECTOR can tow vehicles left in any gear of a mass of up to 1500 kg. Front caterpillars (remote control of tilt angle) increase traction abilities, longitudinal stability and enable smooth motion on stairs, as well as highly uneven terrain. The manipulator is able to lift 30 kg on extended arms and 60 kg on folded arms. The turn of the manipulator’s base amounts as much as 400°. Constant spatial orientation of the object placed in the gripper, irrespective of the movement of other manipulator arms, enables precision manipulation of hazardous devices. Control system of the robot enables to control all of its drives at the same time. A program for automatic folding of the manipulator down to a transport position speeds up and makes easier preparing the robot for transport. 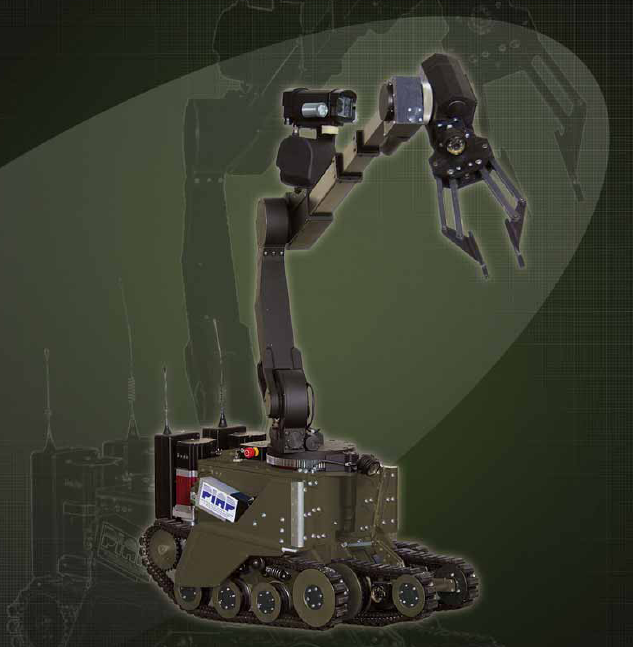 IBIS is a robot for pyrotechnic and combat missions. 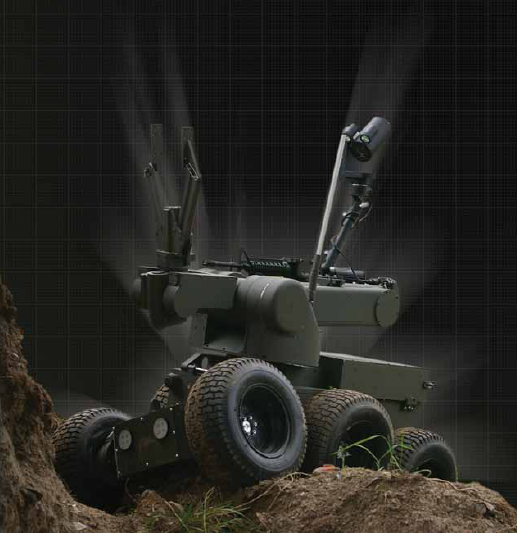 It is designed especially for operations in difficult and diverse terrain (including sand, snow, rocks.) High speed of the robot enables taking dynamic actions. 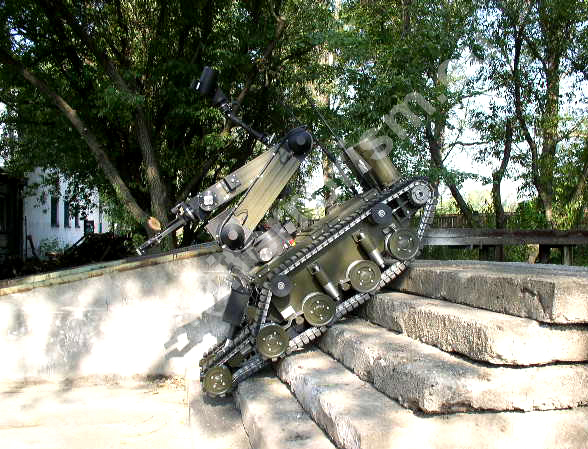 Robot’s manipulator provide big range of activities and applications. Precision drive system gives fluidity of the movement of every part of the robot, even during fast ride. Expert Robot can replace men in situations where human life or health is endangered. It can be used for any mission inside means of transportation for e.g. aircrafts, buses, trains coaches, vesselsand any other small and tight space. Not only can it enter these places, but it also can reach everywhere and grab any load from high or hardly accessible resesses. Explorer is a camera with set of different length telescope extension arms, which makes an inspection of difficult to reach and tight spaces extremely easy. 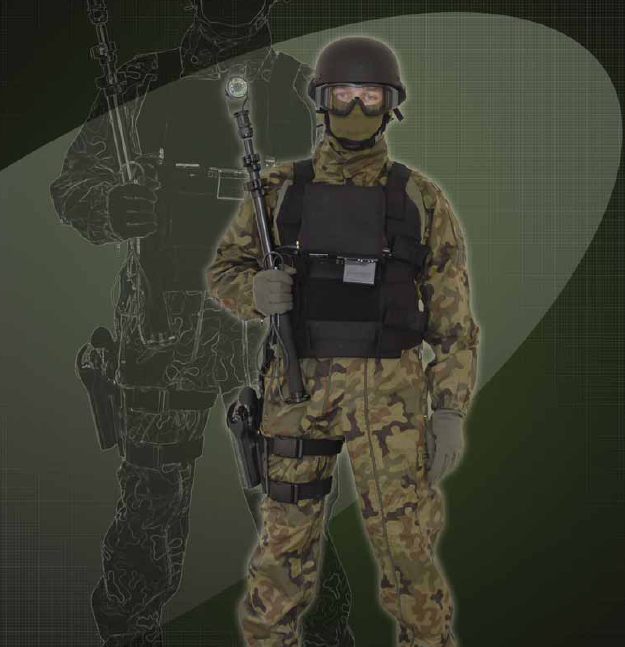 A waterproof version is also available for operations under water or in highly humid environment. It is easy to grab the improvised explosives without a grip by enhancing the picking up ability of nippers to complement former equipment. 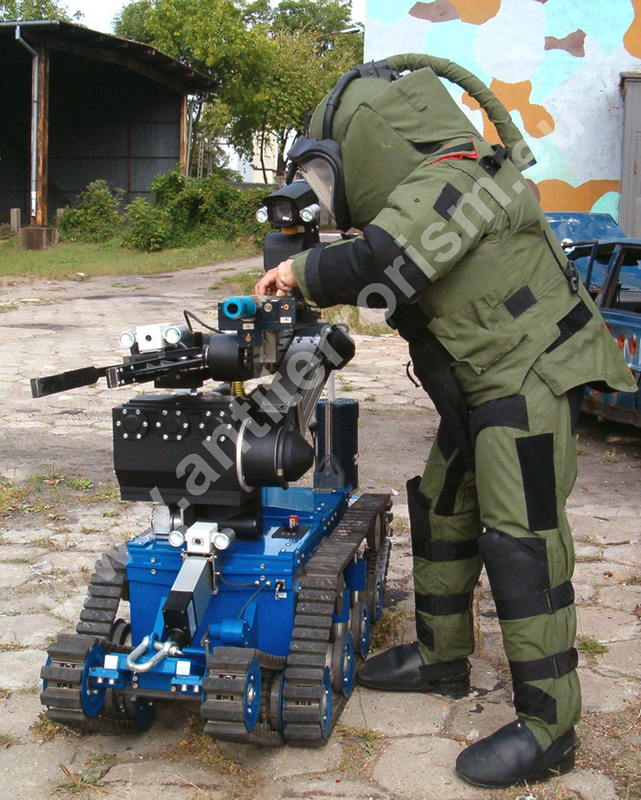 It has been specially designed to enable bomb disposal operators to handle dangerous devices and materials.